Porcelain is a popular material for dental crowns due to its strength and natural appearance, but there are several different types of crowns available for different purposes. Visit this page to learn more about your dental crown options. Even with proper cleaning habits, it is important to monitor your gums for signs of periodontal disease. The New York Times Health Guide provides an comprehensive list of gum disease risk factors. If you’re concerned about your oral health, then consider this list of best and worst foods for your teeth compiled by the Yale School of Medicine. For more information about scholarly studies on CEREC, browse through this article from CEREC’s official website. Take a look at the development of CEREC restorative dentistry in this study from the ADA Journal. Dr. John Carson, DDS, is an experienced cosmetic and restorative dentist in the Tucson area. To schedule an appointment, call (520) 514-7203 today. 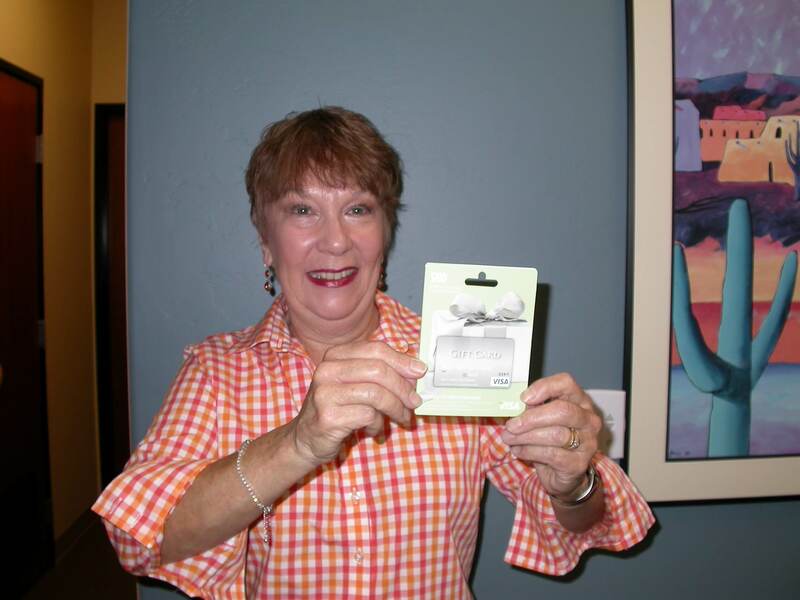 Congratulations Sherrie K. our May 2012 $100 Winner! According to The New York Times, more than three-quarters of all American adults suffer from some form of periodontal disease, ranging from mild gingivitis to more severe periodontitis. Physicians have found links between gum disease and serious health conditions such as diabetes, cardiovascular disease, and Alzheimer’s. Develop Regular Brushing and Flossing Habits. The ADA recommends brushing at least twice a day and flossing at least once, especially after meals. Even perfectly healthy teeth will collect food and debris in the spaces between teeth and below the gum line. This can allow bacteria to accumulate and develop into plaque (and later harden into tartar), eroding tooth enamel and gum tissue if left untreated. Foods that are high in sugars and starch can become trapped between the teeth more easily, reacting with bacteria and producing corrosive acids. Other foods that are bad for teeth and gums include acidic items, such as citrus fruits and carbonated sodas. Avoid these foods to better prevent tooth decay and gum disease. Even with regular brushing habits and a careful diet, it is still important to closely monitor your oral health with dental appointments, because it is possible to have gum disease without apparent symptoms. Other factors such as age, hormones, genetics, pre-existing medical conditions, and certain medications can also adversely impact your periodontal health. The best way to monitor your risk for gum disease is to set up an appointment with your Tucson dentist. Dr. John Carson, DDS, is an experienced dentist helping Tucson patients with cosmetic, preventative, and restorative dentistry needs. Schedule a professional consultation today by calling (520) 514-7203 or by contacting us online. Periodontal, or gum disease, is the leading cause of tooth loss in the United States. Because gums are so essential to oral health, it is important to understand how poor hygiene can lead to periodontal disease. Take a look at this video to see the importance of preventing gum disease with regular dental checkups. Gum disease is most often the result of a buildup of debris and plaque deposits in the space between the gums and teeth. During a dental cleaning, a specialist will use a set of precision dental tools to thoroughly clean the teeth and gums in spaces where regular brushing and flossing does not reach. Our team here at the dental office of Dr. John Carson, DDS is committed to providing the highest level dental care in Tucson. To schedule a tooth cleaning call (520) 514-7203 today, or visit us online to learn more about our other cosmetic and restorative dental procedures. It isn’t uncommon for teeth to become cracked or chipped over time. In such cases, a dental crown can mitigate the damage to the tooth and restore the appearance of your smile. Traditionally, a dentist would have to make a mold of your teeth and send away for a lab-fabricated replacement, but CEREC allows your dentist to construct a digital image of your teeth and fabricate a natural-looking porcelain crown in the same visit, eliminating the need for multiple dental appointments or temporary fillings. Cavities can cause significant pain and sensitivity. Even a few short days with a cavity can seem excruciatingly long. Using the same computer-imaging technology involved in making crowns, the CEREC system can also reconstruct portions of a tooth and produce porcelain onlays or inlays. Your dentist can then restore the affected tooth and provide immediate relief. Even if your teeth are not necessarily damaged, a crooked or discolored smile can have a profound psychological impact. Porcelain veneers are one of the fastest, most effective procedures in cosmetic dentistry for aesthetically reinventing your smile. Because veneers are essentially a series of thin plates that are bonded on top of normal teeth, CEREC technology can drastically reduce the turnaround time for the entire procedure. If you are in need of restorative or cosmetic dentistry in Tucson, then schedule a professional consultation with Dr. John Carson, DDS, by calling (520) 514-7203 today. We provide our customers with access to the latest advancements in dental technology and procedures. Visit us online for more information about our dental services.